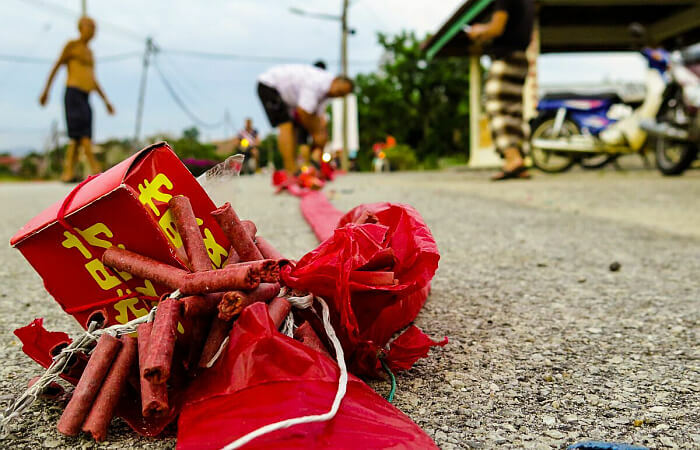 For some, exploding New Year firecrackers in a remote Chinese-Malaysian village helps evoke the forgotten stories of Communist guerrilla resistance. "Gong Xi Fa Cai," a shirtless old man with white hair as robust as hedgehog's spikes screams at me over Lunar New Year's warfare. Dense fumes burst out of a red thread loaded with gunpowder shells. When I accepted the invitation, I never expected that celebrating Chinese New Year in Malaysia would require stepping into a battle zone. But now, I'm surrounded by a mesmerized crowd, a sparkling trail of exploding firecrackers jack-hammers the night, and I realize that the start of this year of the Monkey is definitely going to be explosive. The well-wishing old man soon disappears behind a line of young women. They march onwards, smartphones held up in the air to record this siege for posterity. Families perched on top of motorbikes follow on the sides like six-armed centaurs on wheels, dodging the terrified mangy dogs that jump off the road looking for shelter. All the humanity around me is still not enough to protect my naked limbs from the ricocheting of exploded firecracker shells. Even if they hit, sting, and burn, we keep following the blaze all the way to the end of the village, to the edge of the forest…the place where, 60 years ago, Malayan National Liberation Army fighters hid and preached a dangerous Communist brogue. If I squint now, I can see a line of ghostly guerrilla fighters emerge from the dark jungle to punish us. Even if we just obeyed to the orders of the white colonizers, we turned our backs on them. And now, I'm afraid, it's too late to apologize. "You should come with us. It's going to be an interesting cultural experience, and of course, there will be plenty of beer." That's a hard invitation to put down, especially when it comes from your Malaysian Chinese fiancée's father. For the Overseas Chinese of Malaysia, the Lunar New Year remains big family business. A time to take off the salary man's armour for a good three days of blissful eating, drinking, and catching up with all of life's latest gossip. Any wise foreign partner with a less-than-fluent knowledge of Hokkien, Cantonese, or Mandarin Chinese would say "no thanks" and stay home. But when the invitation involves traveling to one of the kampung baru of rural Perak state, the small villages created by the British colonial rulers to fight back the Communist threat in 1950s colonial Malaya, well, it's hard to say no. Kampung Baru Bali is a neat grid of concrete and wooden houses laid between a rainforest and a branch of the Ipoh-Lumut interstate, one of many gray snakes crawling through Perak's green belly. By local standards, it's a remote part of Malaysia, one completely ignored by the guidebook-toting international tourists who may only be seen hanging around in Ipoh Old Town, the state capital 32 kilometers to the North. Kampung Baru Bali is one of the 450 'New Villages' — from the Malay kampung baru, or xīn cūn in Mandarin Chinese. They were built in the waning days of 1950s British Malaya to combat the "Emergency", a guerrilla war launched by the Malayan National Liberation Army, the military branch of the Malayan Communist Party. The recruits were mostly ethnic Chinese, principally poor rural folks who felt marginalized not having equal vote and land rights. Their supporters formed the Min Yuen, a secret organization that helped pass information, food, and supplies to the Communist insurgents stationed in the surrounding jungles. In 1950, General Harold Briggs decided to create the "New Villages" to control the rural population and cut off the sources of Communist support. The kampung baru were heavily patrolled, fortified with walls, and subjected to severe curfews. Nevertheless, the British managed to bring the locals on their side by giving them water and electricity, schools and health services, thus bringing the starved insurgents out of the jungles. When the British pulled out of Malaya in 1957, they left these New Villages behind as memories of the Red Scare, although there's not much left today to remember it. As I walk down Kampung Baru Bali's main road and past a statue of Confucius standing next to a Ford 5000 tractor, I don't see hammers and sickles, but I get the feeling that it's a much-globalized kind of Communism that is haunting the village today. "We will start at 8 p.m.," an old man says to me with a squint. He's bent on the road performing a yearly ritual, something that to him is much less strange than the appearance of a white man in his far-flung village. He's laying two lines of red firecracker belts, dozens of them in parallel rows, at the two sides of Kampung Bali's main road. 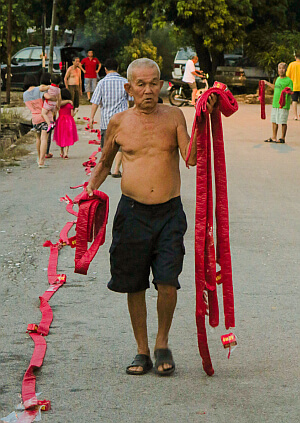 Each belt is almost two meters long and contains as many as several hundred firecrackers. The village elders are setting them down to form a kilometer and a half explosive segment that will turn the main street into unexploded ordnance. A young Malay man, an odd sight in this entirely ethnic Chinese village, comes to talk to me. He lives and works in Kuala Lumpur, and has exploited the holidays to return to his mother's house, a wooden structure right across the road from the Chinese stone archway that crowns Kampung Baru Bali's entrance. 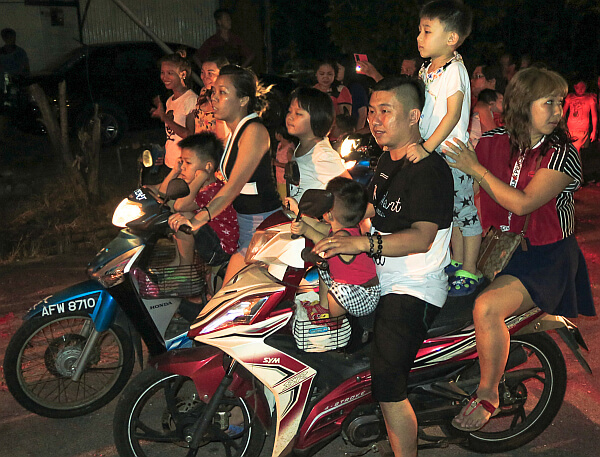 "Last year they had four lines of crackers… It was incredible," he says as other villagers gather around us, some scooting on motorbikes, others standing at the sides of the road, waiting for the show to start. Most of them have returned to Kampung Bali only to celebrate the New Year, as the village doesn't offer much besides peaceful countryside and concerts of frogs and crickets in its silent, long evenings. More firecracker belts mean a wealthier closing of the past year. "I work in Singapore," a Chinese man tells me as he rests his youngest child against his left shoulder. "We always come back to Bali for the New Year's reunion. This year the economy has been worse, and we have stitched together only the sum required to buy two lines of firecrackers," he continues. As he speaks, the old man who announced the ceremony's starting time is bent farther up the road, busy laying his explosive belts in a neat line. Latecomers are helping set the explosives down until they reach the edge of the village and the start of the thicket.